An Expert's Take on the Symbolism in Childish Gambino’s Viral ‘This Is America’ Video, By MAHITA GAJANAN, May 7, 2018, Time. The style of dancing by Gambino in the video also calls out the way we consume culture. Gambino samples at least 10 popular dance moves derived from hip hop and African moves, including the South African Gwara Gwara dance, according to Forbes. Ramsey says the use of so many famous dance moves show how ultra-popular pieces of culture lose their specificity over time as they become more ubiquitous. Toward the middle of the video, a choir sings enthusiastically in a happy tone before Gambino shoots them all. The massacre and its quickness recall the 2015 Charleston shooting in which white supremacist Dylann Roof killed nine black people in a church basement, Ramsey says. The image and what it evokes shows how people struggle to reconcile with and separate different instances of violence, according to Ramsey. As we consume violence on all sorts of platforms, be it in the news, through music videos or television shows, it becomes difficult to absorb very real instances of mass murders. “A black person running for his or her life has just been a part of American culture dating back to slavery,” he says. The new release contains many low-key collaborations with other artists, featuring ad libs and backing vocals from Blocboy JB, Young Thug, 21 Savage, Slim Jxmmi, and Quavo. Most strikingly, SZA makes a cameo leaning on a car after the chaos seems to have subsided. On Instagram, she later posted a picture of her from the shoot that suggests she was embodying a Lady Liberty watching on passively. The visual message is a clear comment on America’s hypocritical, poisonous rhetoric of ‘freedom’, while it abuses and silences the marginalized members of society. While hosting “Saturday Night Live,” Donald Glover dropped a music video for the new single “This Is America” by his rapper alter ego Childish Gambino. Watch it once, and your eyes will naturally be drawn to his movements and facial expressions. Watch it again, but focus on the chaos reigning in the background. Watch it a third time, and the reason for this juxtaposition becomes increasingly clear. The camera soon finds Glover. He stands behind Calvin the Second, whose head has been covered with a bag, and shoots him with a gun pulled out of his back pocket. As several have pointed out on Twitter, his stance while holding the weapon mimics that of the minstrel character Jim Crow, the origin of the term used to describe pre-Civil rights-era segregation laws. Glover’s erratic dancing, choreographed by Sherrie Silver, distracts from everything happening in the background throughout the video — purposefully so, it would seem. Paired with exaggerated expressions like the one pictured above, his movements further the connection to minstrel shows, a form of entertainment popularized in the early 1800s that mocked black people in the United States. The stock characters were usually played by white people in blackface, though some all-black groups performed under white directors. Glover’s character, who appears to represent how white American culture oppresses black people, periodically kills innocent performers. As a choir joyfully sings the refrain — “Get your money, black man, get your money” — Glover slips out from behind a door and dances in front of the choir. He is handed an assault weapon, shoots all 10 singers and walks away. The imagery evokes the 2015 Charleston church massacre, in which attendees of a prayer service were murdered by self-described white supremacist Dylann Roof. As Glover tells listeners to “watch me move,” people in the background are chased by cops. A police car is parked in the viewers’ line of sight, and orange glares suggest fires burning throughout the warehouse. The camera quickly glides past young people with their phones out as Glover says, “This a celly, that’s a tool.” Cellphones have been used to record police officers shooting or choking black people in the past few years. As Glover continues to dance amid the chaos — with another police car parked in view — a hooded figure rides past on a white horse. Some on Twitter have drawn connections to the Horsemen of the Apocalypse from the New Testament’s Book of Revelation, in which death rides on a pale horse with hell following behind. Calvin the Second plays his guitar with the bag on his head as Glover climbs atop a parked car. All the cars pictured — including the one SZA sits on, in a surprise cameo — arefrom the 1980s and 1990s,in contrast with the new, luxury vehicles often depicted in today’s music videos. Some Twitter users theorized that the cars’ age represents the “stalled socioeconomic and political mobility” of black Americans. Others pointed to images of vehicles during the 1992 Los Angeles riots, which began after a jury acquitted police officers of using excessive force while arresting (and beating) Rodney King. The video ends with Glover chased down a dark hallway, and some point to the darkness behind him as a physical representation of the Sunken Place, a mental prison where the Armitage family matriarch sends black people in Jordan Peele’s “Get Out.” How fitting, then, that “Get Out” actor Daniel Kaluuya presented Glover’s performance of the song on SNL. Whether this reference was intended, the video makes clear how black people have been trapped and/or harmed by American culture. Glover’s character keeps the darkness at bay by acting within white-imposed boundaries for most of the video — hence the rich depth of field, with his giddy dancing layered in front of violence — but it eventually catches up with him. “This Is America” is a painful yet perfectly timed masterpiece, what Glover seems to do best. (May 21 2018 2:36PM) : Even though I saw the video for the first time I was shocked because of Gambino had shot a guy that was wearing a bag over his head. Plus The overall message of the video is basically talking about all the violence that is happening here in America. (Oct 22 2018 9:03AM) : I agree this video is talking about violence that is happening in America. (Oct 17 2018 9:09AM) : Gambino did in action of him doing a mockery of Jim Crow. Gambino in this video shoots the black person wearing the bag over his band to show us how guns are more important than the lives of blacks. Do we agree neither you, me, nor Gambino believes that guns are more important than any groups of people’s lives? I couldn’t tell from the way you worded your comment and would be interested in further understanding your perspective if you answer to the the above is not that we all agree here. (Oct 19 2018 4:41PM) : I strongly agree with you. (Nov 13 2018 9:23AM) : You are right, the overall message of this is to bring more awareness to the violence in America. Within the the first minute, Childish Gambino shot a black man with a gun. The gun got carried away in cloth while the body was dragged on the ground. This could mean that black bodies are less important then guns. (Oct 22 2018 6:01PM) : I will have to agree with you black people are treated as nothing. While a gun is being more secure. Childish Gambino wore the same outfit as the confederate soldiers. This could mean that people, mainly worry about high end clothes instead of paying attention to the problems that going on. (Oct 21 2018 5:47PM) : I agree with you because people are mainly concerned about materialistic things. (Oct 25 2018 9:23AM) : At the end of "This is America" Donald runs away from people in darkness, which could be symbolizing slavery long ago when black people were running for their lives or to escape for freedom. What are your thoughts? (May 25 2018 2:39PM) : At the ending I had realized the same women who was in the video called All the Stars that was in the movie Black Panther. it goes into detail from the way she shoots the man in the position he was standing in. how the kids dancing in their uniforms is a distraction to whats going on in the video, how us kids now a days are into every dance challenge and were dancing our lives away. the question is when will we wake up from reality it’s like were brain washed. (Oct 22 2018 9:09AM) : I agree he did do representation of jim crow in the start of the video. significant Childish Gambino is explaining the realization of the U.S, such as the devastating issues on police brutality,civil rights, and white privilege. Childish Gambino explains the devastating issues on police brutality, civil rights and white privilege in many ways throughout the video. The way he did it he you would have to watch the video more than once in order to really get a full understanding. (Nov 07 2018 9:18AM) : I know you all noticed the black children dancing majority of the video, the dancing children can represent black art used to distract people from the real problems happening in America. (Nov 13 2018 9:13AM) : Not a serious comment but did yall notice Donald and the black children hit that short Blockboy JB shoot?? (Oct 12 2018 10:21AM) : The cars at the end are also an "emblem" of American power in money. His body is alone and unrecognized in the midst of all the metal and modern commercialism. (Oct 22 2018 9:14AM) : It was a connection to the charleston church shooting. (Oct 23 2018 9:20AM) : The message of the video is that violence is not the key to everything because in the song he has a bunch of kids dancing with him . (Oct 23 2018 9:21AM) : The song is about all the violence happening in america . (Oct 23 2018 9:23AM) : childish gambino is trying to match with the confederate soldiers . (Oct 25 2018 9:16AM) : This video shows how people care for guns more than people lives. All of this Dancing is a distraction to the real world scenarios. When he does the gun pose it was him doing something that happened in Jim Crow. (Nov 13 2018 9:10AM) : The african kids that are dancing represent that we are blindfold on what is going in our society . white man and start owning our own business. No conversations at 00:02. Start one. No conversations at 00:05. Start one. No conversations at 00:08. Start one. (Oct 12 2018 10:10AM) : This image of this lone guitar seated on the chair in this confined space is powerful. How can music transcend what I see as an oppressive space? the reason I agree with this is because I feel like when he sat in the chair and started to play his guitar it looked so powerful , like this is the way most people make it out & provide for their families . My thoughts on this video is good because i think it gives you signs to which your back. And when the kids came out to dance was like a sign to say ya you can look good and have a lot of stuff but someone out there is going to still be after what you got cause it’s what they want . Also this is America many people get away with there crimes so always watch yo back cause either way it go if you are trying to live and help yourself there will always be someone watching you in every set you take. And if you get cost it’s quiet for you because they not going to help you .they are just going to cover it up for there safety and leave you hopeless. You not going to get what you needed unless to tell someone or snitch on someone an either which way you still going to get messed over if they don’t get what they want you will suffer cause it’s America. Also to me his line ‘’Grandma told me Get your money, Black men(Black men)’’..he sayings black instead of sitting down and blaming other people take responsblilty of our actions. because people go base on the way they think which made them not gather enough information that’s why gun violence been to viral…. Yes, I agree with you but I’m glad you understand what I was trying to say because in the video many people was running around hurting their self like they was becoming a made man on medinice . Where could you better set a video called “This is America” than in a parking lot? We define ourselves by our cars. We are willing to pay rent for them. Our day is cheerful if we find the perfect parking spot. And an empty parking lot is the equivalent of an automobile candy store. (Oct 12 2018 10:41AM) : I think there is also a certain "sameness" to the cars - not much variety in the cars in that lot in the video. (Oct 19 2018 4:44PM) : Did you realize that all the cars are old? No conversations at 00:17. Start one. No conversations at 00:19. Start one. What people are doing in America and to cover up there act upon other. And when I say act upon other as in how so many police offers are getting away with killing babies, teenagers, n adults. However,Some of these crimes aren’t solve yet and still increasing day by day because people feel like if you not them they really don’t care unless they get what they want and they are good. (Oct 12 2018 10:21AM) : I like how joyful this song is at the beginning. The empty space with monotone colors emphasize the j oy of the music. Now that I've seen the whole video, this way of beginning sets us up for strong contrasts. There’s a lot being said here about the black body. CG dances through many types of music (from African to Gospel to contemporary) which allows him to emphasize how his body is moving shirtless. Reminds me of Coates and his argument around how death and abuse of the black body is acceptable because of the white gaze and devaluation of the black body. The focus on money is made immediately in the video next to lyrics about the party. It could be assumed that the We are the people that CG represents, but perhaps not. No conversations at 00:30. Start one. No conversations at 00:33. Start one. No conversations at 00:43. Start one. (Oct 12 2018 10:23AM) : Hints that the "party" isn't all joyful--not in really obvious ways/words, but in subtle disjunctions of movement and facial expressions. Whoa, the music is beautiful and uplifting then this hooded figure awaiting execution emerges. At this moment it feels clear why we are in this oppressive institutional setting as an execution is about to take place. Who? What? Why? Blacks till this day feel very enslaved. They dont feel equal and they get treated unfairly. This reminds me of the ISIS executions in Syria. Jim Crow was the name of the laws set during the time of segregation of whites and blacks (people). As Childish Gambino is in this stance he’s aiming a gun at a colored mans head while wearing what seem to be the pants that confederate soldiers wore. Showing the issue of racism is still at hand in America. Yes, excellent observation about the Confederate uniform! he is impersonating a Jim Crow poster that was created back when segregation in America was at it’s worse. I think that the person sitting in the chair with the sack over his face is supposed to be a slave because at first he was playing the guitar & looked happy but then out of nowhere he is wrapped in a sack and shot in the head. Honestly i feel like the guy with the sack on his head is supposed to symbolize how us blacks feel today with the racism, inequality etc. its like we are still enslaved and this shouldn’t be happening in 2018 Untied States of America. (Oct 17 2018 9:23AM) : He did the stance from jim crow a white man who painted his skin black and acted like black people doing stupid stuff. (Oct 22 2018 9:10AM) : Thank you, the Jim Crow meaning makes sense now. Jim Crow was just a stage name. In this video, he uses the Jim crow pose to depict the system of racial Apartheid that dominated the American South for three quarters of a century beginning in the 1890s. Jim Crow refers to the repressive laws and customs once used to restrict the rights of people of color. Yes, this is a dramatic work of art. But how do you know it speaks for such a wide a segment of the population? i agree with this comment for many different reasons. This video is showing how society use to be and how it currently is till this day. CAUSE MANY PEOPLE ARE FALLING OFF BAD AS IN THEY STOP CARING ABOUT THERE LIFE MANY PEOPLE START TO CARE MORE ABOUT WHAT THEY CAN GET FROM YOU IF THEY USE YOU. Then when i saw him shoot the man with a bag over his head it came to my head that this is what America is really like today. When he wiped of the gun i thought about the things that happened because that’s how many people don’t get caught because they think that they’re smart but everything soon comes to an end . People get away with crimes so easily. You can kill someone and wont get introuble. Many blacks were killed for no reason and nothing was done about it. (Oct 17 2018 8:36PM) : The gun I carried away so carefully while the dead body is being dragged off. It shows that we have more respect for guns than we have for human beings. No conversations at 01:00. Start one. Throughout the video his was giving signs and hints that could be naked to the human eye. He even had a message through his background. But the people where to busy look how he turn up and didn’t realize at the beginning of the video he had the left side of his pants leg over his shoes and the right down …why not both up or both down ..why one up and one down ?. After Childish Gambino shot the man he said,‘’ This is America Don’t catch you slippin’ up’’ and he did a dance as in if got away with the murder. I wonder is he relating this to the many crimes that many police offers got away with. Interesting that you believe in this group? Are you or anyone you know a member? How would one come to be a member? Isn’t is more likely that, as with all of the best poetry, he is layering meaning and using ambiguity to allow us to place our own experience onto what we are seeing? As he shoots the hooded man (hooded so we don’t know his age, his race, his face) it is clear that the human life he takes has no value to him. But the gun is another matter, to be placed carefully in a red cloth and put away for when next it is wanted. (Oct 12 2018 10:25AM) : Sudden violence, but still there's strange disjuncts in his gestures and expressions--his whole body communicates confusion, and the strange way we live contradictory lives--joy and violence. Brilliant and powerful. i think as he switches places in the video whereas one moment he’s representing minorities then hes imitating the privileged has a lot to do with the fact that he looks ungroomed as a stereotypical black man on top and a racist white man on the bottom. But I agree because he really was litty in the video and also his back I do agree many people didn’t notice whats was going on in the video. Is that relating to the gov. like I wanna know is he playing a role of gov. how they make a plan and people see what they are doing and can’t do nothing about it because they got people covering up for them so they can get away with it. No conversations at 01:13. Start one. (Oct 17 2018 8:43PM) : Childish Gambino and the kids are dancing in front of all the chaos . I think he is trying to say that we dance around everything and don’t pay attention to what’s happening around us. This cheerful murderer gathers kids behind him, smiling and happy to be part of the dance. I watch how charismatic people draw fans to them no matter how awful they may be. Make America Great Again, follow me! (Oct 17 2018 9:14AM) : This is really good because it shows many kids in the back dancing and that's really how some people make it for their families. Dance can really help many different people that's why they come out with many different challenges every other day for kids. (Oct 22 2018 9:10AM) : The kids are dancing distracting us from the chaos that happening in the back.It show us that we have so many distractions today and forget what is happening in the world.WE dance around everything when people are taking from us as colored people. Black and brown men and women are executed by the police who are a part of the criminal justice system designed to protect all citizens. Black and brown folk seem to be excluded from the citizenry in this here Amerikkka. Either way it go with or without police things are going to be bad because look what world we live in ,People don’t go by the rules. And by have police around dosen’t make it any better because they think their doing right when it’s really going to make people react more because of the crimes many police officer gotten away with. Childish Gambino is trying to show us that there is so much going on in this country & we not even paying attention to it. Everytime there is something big going on in our country we end up getting distracted by something else. This explains that in the society, we ignore the most pressing issues and concentrate on the less important ones. we are being distracted too easily and don’t focus on the things happening around us; instead we’re more interested in fights between Cardi and Nicki or the new songs travis Scott just released. This part indicates guerrilla tactics that a member of a small independent group takes part in irregular fighting,typically against regular forces. This explains how citizens of America protest on some racial and social justice issues against the government that oppresses people of color. We have many violent communities in our nation. However, I rarely hear any outrage. For instance, this past weekend (May 14th and 15th) 40 people were shot in Chicago; 5 of them died! And yet, this event was not mentioned on the news this week. Put money in thy purse. Follow thou the wars, defeat thy favor with an usurped beard. I say, put money in thy purse. It cannot be long that Desdemona should continue her love to the Moor—put money in thy purse—nor he his to her. It was a violent commencement in her, and thou shalt see an answerable sequestration—put but money in thy purse. These Moors are changeable in their wills—fill thy purse with money. The food that to him now is as luscious as locusts shall be to him shortly as bitter as coloquintida. She must change for youth. When she is sated with his body she will find the errors of her choice. Therefore, put money in thy purse. If thou wilt needs damn thyself, do it a more delicate way than drowning. Make all the money thou canst. If sanctimony and a frail vow betwixt an erring barbarian and supersubtle Venetian be not too hard for my wits and all the tribe of hell, thou shalt enjoy her. Therefore make money. A pox of drowning thyself! ’Tis clean out of the way. Seek thou rather to be hanged in compassing thy joy than to be drowned and go without her. He goes on to talk about revenge and hatred of Othello so the idea of money takes on many meanings including being prepared to fight, being ready to buy what’s needed (land), and being armed. No matter where, no matter how, get your money. Guns are good business and blood is a small price to pay for good business, or so it seems. (Oct 17 2018 9:19AM) : He did an action from the church shooting in Texas. this is a representation what happened in charleston where a choir got shot in the church. (Oct 22 2018 9:15AM) : Here again the gun i carried away with so much respect.When the choir is just left their with no type of respect. There is no safe or sacred space for African-American in “this America” as execution can occur at anytime and anyplace at the hands of law enforcement or or the hands of a depraved gunmen. The title of the video is “This is America” not just black America. Isn’t Adelphe right about everyone? (Oct 12 2018 10:41AM) : This is such a scary way to grow up African-American. I can only TRY to empathize, and I'm sharply aware of how limited my empathy really is. I think. Why do we accept this, Adelphe? Is there any way we can stop it? Do other countries have the same worry? Can America back away from this or does our Constitution guarantee that this will go on forever? He was symbolizing the shooting that happen not to long ago when the guy shot up the chruch. This connects to the mass shooting in Charleston Church. where Dylann Roof, a 21 yr old white supremacist murdered nine African-Americans during a prayer service. Moreover, you notice how the gun is being handled with special care while the bodies just lie there. Innocent people get killed everyday. Living regular lives. This shows how violent america is. You never know when you could go. In this clip as the lyrics “Won’t catch you slipping up” plays; Gambino shoots an entire choir then carefully hands the gun off. Out of this I’m gathering that as long as you handle the weapon correctly and fled the scene you can get away with murder no matter how many you killed or where you killed. No conversations at 02:09. Start one. 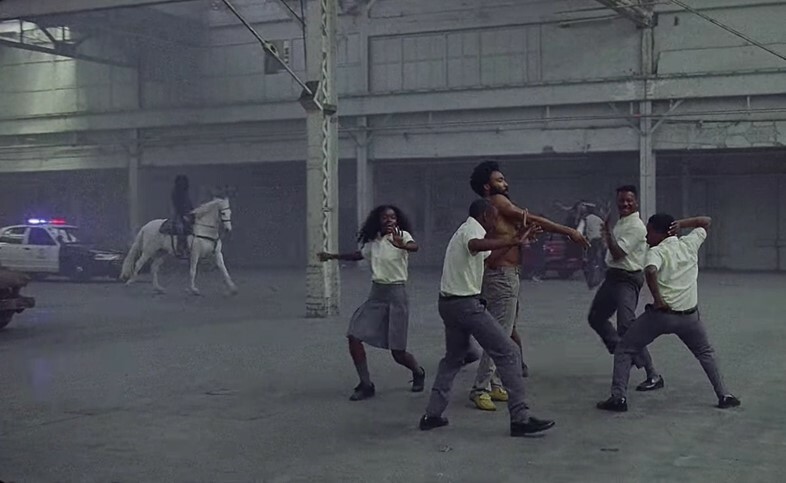 While Gambino and a group of people of color are performing culture born dances in the middle of the screen, there is a ton of chaos in the background that doesn’t catch the eye immediately because the dancing is more pleasureful. Ah wow very interesting point, Ty’ana. I had not gathered that from my first viewing of this. Brilliant observation! No conversations at 02:20. Start one. (Oct 22 2018 9:24AM) : the kid in the background has his phone out taking a video with all the chaos. Now we live in a society were we pull out our phone to get the tape not to call the police. This is what happens in the society today, when you see two teenagers fighting, then other teenagers gather around to record the fight so they could post it on facebook and their other social media platforms; instead of them trying to break up the fight. But you have to also look at how the person take it for them to react like that in anyway to create violence. the white horse represents slavery and also represents the police bringing us black people down. Seeing this man on a horse makes me think of a few things like when slave masters rode through fields full of slaves to oversee them or when white men rode through african american villages on horses and set their houses on fire. (Oct 22 2018 5:50PM) : The man on the horse is portrayed as death and the police car is following. He is trying to say the police would be the end to colored people. (Oct 17 2018 9:21AM) : The white horse with the guy with something black is an example and he is tryna show the ploce bringing us to our death. No conversations at 03:09. Start one. No conversations at 03:19. Start one. This showing that with all the wealth that African Americans, they still go through struggles in life. No conversations at 03:25. Start one. Gambino is being chased by white people, i feel like he’is trying to symbolize that white people are simply targeting black folks. I also think he got this idea from the movie ¨Get out¨when the guy was running from who knows what. this is significant because Gambino was trying to show how society is discriminating people because of their color and something interesting thats i notice was that he use a peace from the movie “get out” when the men was running.. Even though the Black person in this video acted all tough and all in the beginning, middle at the end he still ran from white people. This comes to show that no matter how tough black people are, at the end they will always have fear of the white community. (Oct 22 2018 5:48PM) : I will have to agree with you. Through out the video he was acting like a normal black man who is strong but at the end he acted like he was gonna die if he fought back. I wonder do his song at the end relate to slavery how black people use to run from there white salve owners just to get away to be free .They ran to the underground railroad to be free and to help other slave’s escape. Childish Gambino says “we just wanna party”. Children always wanna party and they remain completely oblivious to the current events that is happening in the world. We are to preoccupied with social media and many other things. The police are killing people when there job is suppose to protect and serve. Lots of black people in America have money to be able to afford lots of expensive things. But even though their rich they still have struggles. (May 25 2018 2:42PM) : I still remember the time when a church was shot up by a white dude plus Gambino had used the same position that Jim Crow was in. (May 30 2018 2:34PM) : In this part of the video it shows the instrument that the guy is playing which during the Civil Rights black people have been playing the same instrument. Also its one of the symbols that have a history. it’s important for many people to know that just because somebody can commit to a crime that you didn’t do but they did with your idenity can get away with it because that person don’t want to do the time for something they commit.